↑ "Glasgow 2014: Usain Bolt, Nicola Adams and Tom Daley all win gold". बीबीसी स्पोर्ट्स. अभिगमन तिथि 3 अगस्त 2014. ↑ "Glasgow 2014: Wales chief Brian Davies delighted with medal haul". बीबीसी स्पोर्ट्स. अभिगमन तिथि 3 अगस्त 2014. ↑ "Kataotau wins Kiribati's first Games medal". सिडनी मॉर्निंग हेराल्ड. 31 जुलाई 2014. अभिगमन तिथि 31 जुलाई 2014. ↑ "बीबीसी न्यूज़:Scotland:Final push for Glasgow 2014 Games". बीबीसी न्यूज़ जालस्थल. बीबीसी न्यूज़. 5 नवम्बर 2007. ↑ "The Gambia withdraw from Glasgow 2014 Commonwealth Games". डेली मेल. डीएमजी मीडिया. 2013-10-06. अभिगमन तिथि 2014-06-19. ↑ "12 For Commonwealth Games". 7 News Belize. 15 जुलाई 2014. अभिगमन तिथि 4 जुलाई 2014. ↑ "Bermuda's 18-strong Commonwealth squad announced". Bermuda Sun. 20 जून 2014. अभिगमन तिथि 22 जून 2014. ↑ Keetile, Portia (6 जुलाई 2014). "Bermuda's 18-strong Commonwealth squad announced". Daily News (Botswana). Gaborone, Botswana: BOPA. अभिगमन तिथि 7 जुलाई 2014. ↑ "10 Athletes For Glasgow Commonwealth Games". Virgin Islands Platinum News. 7 जुलाई 2014. अभिगमन तिथि 7 जुलाई 2014. ↑ Salleh, Ak Fauzi (19 जुलाई 2014). "National cyclist to represent Brunei at Commonwealth Games in Scotland". Brunei Times. Bandar Seri Begawan, Brunei. अभिगमन तिथि 21 जुलाई 2014. ↑ Vubemtoh, Fred (8 जुलाई 2014). "Cameroonian Athletes In Aberdeen For Commonwealth Games". Cameroon Tribune. अभिगमन तिथि 8 जुलाई 2014. ↑ "Susan Nattrass named Commonwealth Games flag-bearer". CBC Sports. Toronto, Ontario, Canada: CBC. 26 जून 2014. अभिगमन तिथि 26 जून 2014. ↑ Anderson, Gary (30 मई 2014). "Cayman Islands names biggest ever Commonwealth Games squad for Glasgow 2014". Insidethegames. Insidethegames.biz. अभिगमन तिथि 22 जून 2014. ↑ Anderson, Gary (18 मई 2014). "Falkland Islands names largest ever squad as 25 athletes set to compete at Glasgow 2014". Insidethegames. Insidethegames.biz. अभिगमन तिथि 22 जून 2014. ↑ "Kirani James leads 16-member Grenada team to Commonwealth Games". Jamaica Observer. St. George's, Grenada. 10 जुलाई 2014. अभिगमन तिथि 10 जुलाई 2014. ↑ "Glasgow 2014: Guernsey name Commonwealth Games team". BBC. 12 जून 2014. अभिगमन तिथि 22 जून 2014. ↑ "GOA names team for 2014 Commonwealth Games". SportsDesk. 23 जून 2014. अभिगमन तिथि 25 जून 2014. ↑ "India to send 215 athletes in Glasgow Commonwealth Games". डेक्कन हेराल्ड. 11 जुलाई 2014. अभिगमन तिथि 11 जुलाई 2014. ↑ Anderson, Gary (18 मई 2014). "Cyclists Cavendish and Kennaugh head largest ever Isle of Man squad for Glasgow 2014". Insidethegames. Insidethegames.biz. अभिगमन तिथि 22 जून 2014. ↑ "114-member team for Commonwealth Games". Jamaica Observer. Kingston, Jamaica. 3 जुलाई 2014. अभिगमन तिथि 3 जुलाई 2014. ↑ "Le Couilliard to carry Jersey flag". Channel Online Tv. 3 जुलाई 2014. अभिगमन तिथि 7 जुलाई 2014. ↑ Singh, Aftar (11 जून 2014). "Nicol to lead Asia, Chong Wei to lead M'sia at CWG". The Star (Malaysia). अभिगमन तिथि 26 जून 2014. ↑ "35 Namibian athletes to Commonwealth Games". The Namibian. 7 जुलाई 2014. अभिगमन तिथि 7 जुलाई 2014. ↑ "Team complete with hockey naming". New Zealand Olympic Committee. 8 जुलाई 2014. अभिगमन तिथि 8 जुलाई 2014. ↑ Abbasi, Kashif (23 जून 2014). "Northern Ireland sends biggest ever team to Commonwealth Games". The News Letter. Belfast, Northern Ireland. अभिगमन तिथि 25 जून 2014. ↑ "Pakistan to send 62-member contingent to Commonwealth Games". The Express Tribune. इस्लामाबाद, पाकिस्तान. 18 जुलाई 2014. अभिगमन तिथि 18 जुलाई 2014. ↑ "Team PNG Set To Make Their Mark Offshore". EM TV. 19 जून 2014. अभिगमन तिथि 25 जून 2014. ↑ Mugabe, Bonnie (18 जून 2014). "Rwanda: RNOC Pick Team for Glasgow Games". AllAfrica.com. अभिगमन तिथि 25 जून 2014. ↑ "St Helena Team Leaves for Commonwealth Games" (PDF). St. Helena Independent. 11 जुलाई 2014. पृ॰ 3. अभिगमन तिथि 11 जुलाई 2014. ↑ Anderson, Gary (12 जून 2014). "Hosts Scotland reveal final names in largest ever Commonwealth Games squad for Glasgow 2014". Insidethegames. Insidethegames.biz. अभिगमन तिथि 22 जून 2014. ↑ Yong Teck, Lim (2 जुलाई 2014). "Dual-contingent flag presentation ceremony mark start of Singapore's 2014 Commonwealth Games and YOG journey". Red Sports. अभिगमन तिथि 2 जुलाई 2014. ↑ Jackman, Rebecca (16 जुलाई 2014). "SA's finest off to Commonwealth Games". Daily News. अभिगमन तिथि 16 जुलाई 2014. ↑ Wasala, Chinthana (27 जून 2014). "Nishanthe Piyasena appointed Chef-de Mission". Daily News (Sri Lanka). अभिगमन तिथि 3 जुलाई 2014. ↑ Kimaro, Frank (17 जुलाई 2014). "Confident Team Tanzania Jet Off". Daily News. अभिगमन तिथि 17 जुलाई 2014. ↑ "TTOC NAME 148 FOR COMMONWEALTH GAMES". Trinidad and Tobago Newsday. अभिगमन तिथि 12 जून 2014. ↑ "COMMONWEALTH TRACK AND FIELD TEAM NAMED". Trinidad and Tobago Newsday. अभिगमन तिथि 29 जून 2014. ↑ Southcombe, Matthew (4 जुलाई 2014). "Commonwealth Games 2014: The team has been finalised - meet the athletes who will represent Wales in Glasgow". WalesOnline. Media Wales. अभिगमन तिथि 4 जुलाई 2014. ↑ "Medal Event Programme for Glasgow 2014" (PDF). Australian Commonwealth Games Association. 25 नवम्बर 2012. मूल (PDF) से 2013-11-05 को पुरालेखित. अभिगमन तिथि 14 दिसम्बर 2012. ↑ "Glasgow 2014 to Stage Biggest Ever Commonwealth Para-Sport Programme". अंतरराष्ट्रीय पैरालंपिक समिति. 1 मई 2012. अभिगमन तिथि 14 दिसम्बर 2012. ↑ "No Triathlon at Delhi Games". Isle of Man Newspapers. 10 फ़रवरी 2007. अभिगमन तिथि 14 दिसम्बर 2012. ↑ "Glasgow 2014 Sports Programme Finalized". www.glasgow2014.com. 1 मई 2012. अभिगमन तिथि 14 दिसम्बर 2012. ↑ "Commonwealth Games 2014: Women's boxing included". बीबीसी. 2 अक्टूबर 2012. अभिगमन तिथि 14 दिसम्बर 2012. ↑ "Full competition schedule" (PDF). 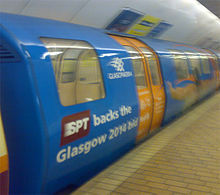 Glasgow 2014 Ltd. अभिगमन तिथि 28 सितम्बर 2013.